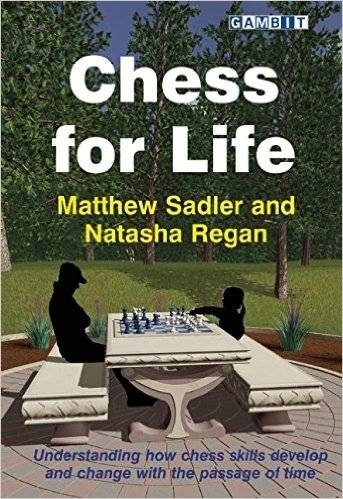 The strong British grandmaster Matthew Sadler doesn't really fit in today's routines of professional chess. As (sub-) worldclass-player he stopped playing in 2000 and chose a normal civilian life. Only in 2010 he found back his love for chess not by accident after his divorce. The rust quickly disappeared and today at age 42 he has a peakrating of 2670. Not surprisingly we find back this unusual career also in his style of play. Creativity and originality are omnipresent in his games. Experiments with dubious openings happen regularly. You will seldom see big theoretical battles. A couple of months ago a new book Chess for Life was presented by this intriguing player so obviously I got curious. It wasn't an ordinary concept as by a number of interviews and analysis they explained how chess-skills develop or are maintained over the years. So it is not the usual technical book but rather an interesting psychological look at how some people keep playing strong chess. The chapters were very varied even to such degree that it looked like a potpourri. There is much entertaining/ interesting stuff to discover but I couldn't find a common thread through the book. Unless maybe that active players consider winning still very important later in their career. Age seems not to matter really as the game is in the first place played to defeat the opponent. At the same time this also can give an explanation why so many players quit. Or winning is not so addictive anymore or it just becomes too difficult to keep on winning more games. The recently passed away legend Viktor Korchnoi was naturally the identification of an insatiable fighting spirit. I even read in 1 of the more unique obituaries on schaaksite that at the age of 73 he still hoped to increase his rating above 2650. I was slightly disappointed to read that winning was of such importance for older players. I had hoped for other aspects of the game getting more attention in the book. Instead we get an overview of different techniques of how to stay successful in chess despite aging. Some players are even more ambitious. What can you do to make still progression and achieve a higher peakrating despite being not so young anymore? Of course it matters a lot when we talk about a comeback or not. In the book the English FM Terry Chapman explains how he achieved at the age of 57 the FM-titel after 5 years of study. Closer we have our own even more powerful comeback of strong Jan. He achieved the IM-title at the age of 67. Also he spent an enormous amount of effort to improve his level. Players having already a long active career, will get it of course much more difficult to find a way to increase their rating. There is not only less margin to study more but old (bad) habits are very hard to change. A recent exception is the natural Granda Zuniga (not long ago already popping up in my article extra sweet). On chess.com there was recently an article published in which he was congratulated with his new peakrating of 2699 at the age of 49. It is no surprise that in a recent interview he admit to work today in a much more structured way. A great performance but maybe even more stunning is what our Belgian grandmaster Luc Winants achieved a few months ago. Not only he reconquered the first ranking upon young grandmasters such as Bart Michiels and Tanguy Ringoir but at the age of 53 he also managed to raise his peakrating till 2574 elo (fide). Luc pumped up his rating quietly with some solid victories. An example you can find in below technical clean game against the very experienced Russian grandmaster Vyacheslav Ikonnikov. Beating weaker players won't let you win many points but if you do it regularly then it still helps to improve the rating. A few years ago I didn't stand a chance in my game against Luc in the Belgian interclubs. I don't know Luc personally so I can only guess how much he worked at chess. I am curious if he developed new techniques or adopted new methods. It is a pity that there hasn't been more publicity about this unique performance. Schaakfabriek doesn't bring much news anymore today.